Capturing the defiant creativity of a home-grown hip-hop movement, the award-winning documentary Inside the Circle follows talented b-boys Josh and Omar, former best friends turned rivals. I’ve been alerted by my all so loyal blogging fans that I’ve been slacking in my duties, and to that I apologize. So some of the stuff going on in the world of Among B-Boys and Christopher Woon. I’ve been finishing a video for a client (OASES 25th Anniversary celebration tonight!) and been chasing that funding paper trail. I’m also set to join a team promoting the ever so entertaining B-Boy Hella Hung, and projects revolving Hung that are in development. 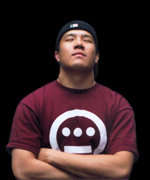 When I first brought my project, Among B-Boys, to CAAM as a Media Fund applicant, I did so with a feeling of entitlement. I was on a quest and I would not be denied: I needed funding, I deserved funding, like so many others, “this project HAD TO BE MADE”.